former name for Moraxella catarrhalis. An obsolete synonym for Moraxella catarrhalis, see there. The species causing epidemic cerebrospinal meningitis. Species found in mucous membrane of the respiratory tract. Occasionally, this species may cause bacterial endocarditis. Albert Ludwig S., German physician, 1855-1916. 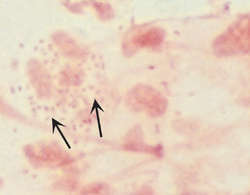 Neisseria - a genus of aerobic to facultatively anaerobic bacteria (family Neisseriaceae) that are parasites of animals. Neisser syringe - a urethral syringe used in treatment of gonococcal urethritis. Moraxella catarrhalis, also known as Micrococcus catarrhalis, Neisseria catarrhalis, or Branhamella catarrhalis is a gram-negative, aerobic, oxidase-positive diplococcus.